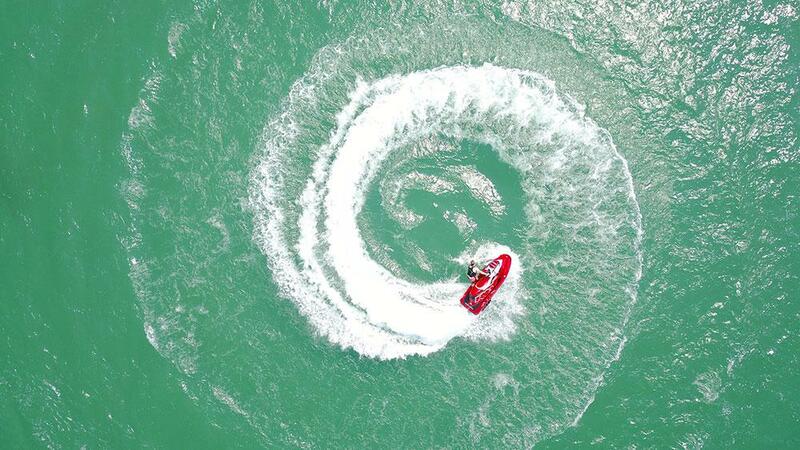 Whichever personal watercraft you choose for your cabin, you're in for a sweet ride! Check out these different types of PWC's and choose which one is right for you. A decade ago, having a personal watercraft at the cabin probably delighted your friends and family... but annoyed the s'mores out of the neighbors. Thankfully, today's generation of personal watercraft have matured far beyond the noisey, often dirty two-strokes of old. Powered by clean and quiet four-stroke engines and featuring hulls that can handle wide-ranging interests, they've actually become shining examples of eco-friendly marine transportation. And the best news? These highly personal machines haven't lost the fun factor that has created many a summer memory over the years. In fact, recent advancements in technology and design have only added to the rider's enjoyment - and may even inspire those noise-wary neighbors to consider buying a PWC of their own. Musclecraft riders are interested in power, whether they’re towing their friends behind them on a wakeboard or just enjoying a rip roarin’ solo ride across the lake. Kawasaki, Sea-Doo, and Yamaha all offer reasonably priced introductory models that blend fun and moderate performance with stability and predictable handling. They’re great not only for beginners but also for those who simply want to keep costs and speeds to a minimum. The Touring segment is for those who want it all. Manufacturers of these machines place a premium on long-distance touring ability, but also recognize that some people just want the best of ... well, of everything. Find today’s average PWC a little too much like the living room couch? A collection of niche models awaits to make your day. • Yamaha VXR – Interested in musclecraft power without the premium price tag or buzz-killing fuel bill? Yamaha has taken the lightweight VX hull and dropped in their 1.8-liter engine to produce a moderately priced boat with an amazing power-to-weight ratio and the ability to run with the industry’s most elite players. ($11,199). Whatever machine you choose, you’re in for one sweet – and relatively quiet – ride. After 20 years of riding and testing PWCs, Jeff Hemmel has almost convinced friends he has a real job. Almost.